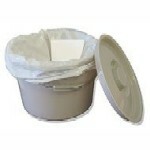 The easily concealed plastic commode pot has a handle that is easily removed for emptying and cleaning. The Derby Basketweave is a wood framed armchair styled commode chair with a woven fiber upholstery in a basketweave weave finished in attractive white and gold coloring. 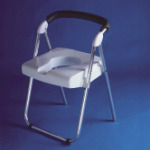 The high sides of the chair give support for the hand and forearm when sitting down and rising from the chair. 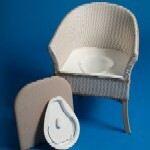 The removable seat has flame retardant foam padding covered in vinyl. 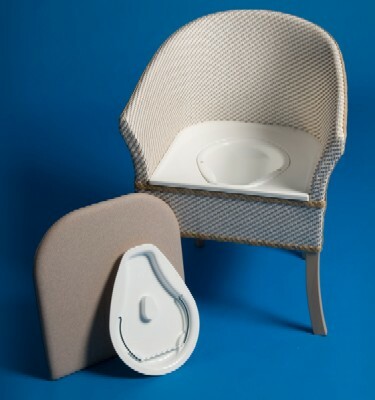 The commode benefits from being protected by the Gordon Ellis antibacterial system. 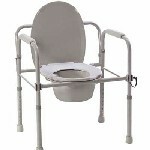 Click on ""more pictures"" button above to see the commode chair's dimensions. 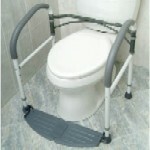 CM77002BP Cleanis Pan Liner fits this bedside commode.